Talk about the "house of mouse!" The phrase "house of mouse" just took on a whole new meaning with the launch of Disney Home. 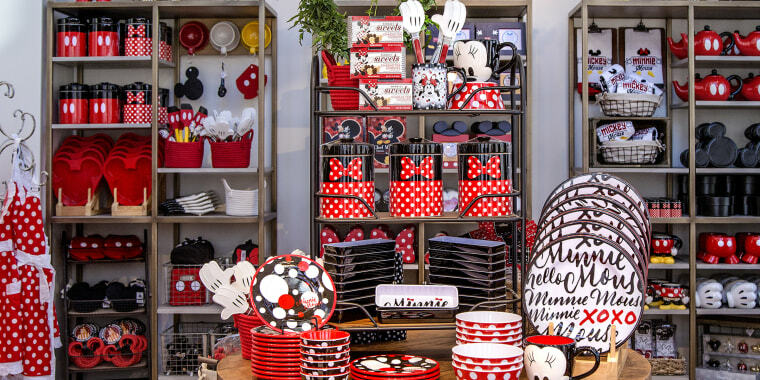 The new store, which opened in the California park's Downtown Disney district last week, offers every piece of Mickey (and Minnie and Goofy)-inspired decor you could possibly want for your home. The curated collection includes everything from glassware to linens to kitchen utensils and so much more, with Disney Park's reporting that it will be updated every season with even more items from your favorite characters. Some initial favorites, available now in store, include: Mickey Mouse house plants (which should indisputably be called "mouse plants"), throw blankets that show off Mickey and Minnie's love (that would make the perfect belated Valentine's Day gift), and an entire collection of pet goods so that fido — or better yet, Pluto — can get in on the fun. There's also a set of "Beauty and the Beast" themed plates, which sadly won't burst into a rousing rendition of "Be Our Guest" halfway through your dinner party, though they do "live to serve" as the song proclaims. The wares are available at the Disney Home shop and in other places around the Anaheim, California park. According to release from Disney Parks, this latest launch is part of a "continuous, promenade-wide transformation happening at the Downtown Disney District" throughout 2018. And for anyone who isn't planning on jetting off to the "happiest place on earth" any time soon, some of the Disney Home items are available online — though, they're best ordered while streaming a VHS copy of "The Little Mermaid."